Energy savings and cheaper bills are the benefits some customers say they’ve enjoyed since getting a smart meter. But others say the exact opposite. Find out who is likely to make the most of their smart meter, plus tips to get more from yours. A key advertised benefit of smart meters is that they give you real-time understanding of your energy use and spend so you can make changes to cut back. But our research reveals that many customers are not seeing this benefit. Some 34% of smart meter owners think their gas and electricity use has reduced since they had a smart meter installed. In contrast, 20% of smart meter owners think theirs has increased. The remainder didn’t think that their energy use had changed since getting a smart meter. That’s according to our online survey of 2,910 Great British energy customers with smart meters in September 2018. Read on to find out who is more likely to cut their energy bills with a smart meter. Or find out what is a smart meter? Who is saving energy with a smart meter? Customers who said they had a smart meter installed because they wanted one were more likely to find that their energy use had fallen since they got one. Some 42% who installed a smart meter because they wanted one and proactively contacted their energy company said that their energy use had reduced since getting one. Similarly, 47% of those who were recommended smart meters by family or friends said that their energy use had decreased. But only 26% of those who said they were persuaded by their energy company to have a smart meter agreed that their energy use had fallen. While 33% disagreed. How can I save energy with a smart meter? Replace old-style bulbs with LEDs. Over the lifetime of the bulb it could cut around £200 from your electricity bill. See our light bulb reviews. Turn off gadgets, rather than leaving them on standby. This could shave around £30 per year from your bills. Only run your washing machine and dishwasher when they’re full, and use energy-efficient programs. Dry washing outside when possible, rather than using your tumble dryer. Avoid putting warm food in your fridge or freezer as they have to work harder to maintain the temperature. Defrost frozen food in your fridge; it acts like an ice pack so your fridge will need to use less electricity to keep cool. Read more kitchen energy-saving tips. If you’re not feeling chilly, turn your heating down by just 1°C. This could save a typical home around £75 per year. Use your heating controls to set your central heating and hot water to come on for when you need them. Only heat parts of your home that need it. If you have an unused room, turn off the radiator and shut the door. Cut draughts around windows, doors, loft hatches and more to save around £20 per year. Find out how to do draught proofing. 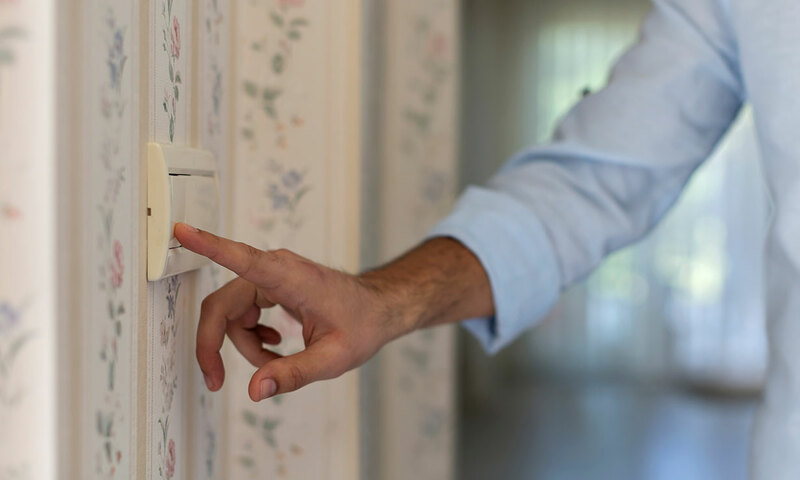 Read more money-saving tips for your heating controls. If you have a smart meter, you’ll be able to track any changes straightaway. If you don’t, submit meter readings on a regular basis to make sure any savings are reflected in your bill. Know how to read your gas meter and how to read your electricity meter. To save more money on energy, compare gas and electricity prices using Which? Switch to see how much money you could save. 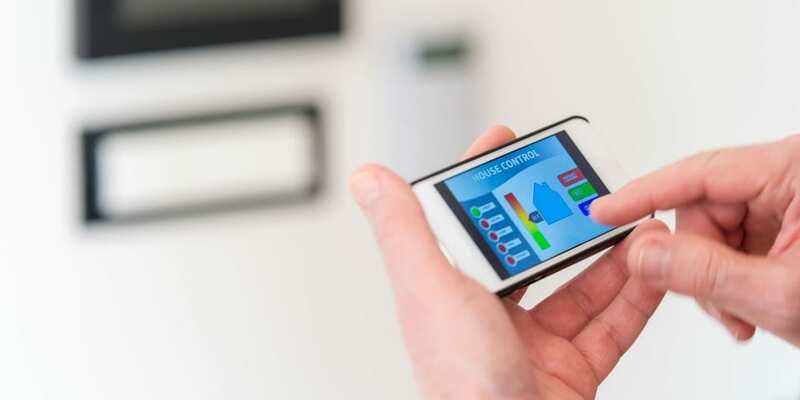 Time-of-use tariffs and smart appliances: are you tempted? Having a smart meter will allow you to access tariffs that charge different amounts for electricity used at different times of day. For example, one that offers cheaper rates during the daytime if that’s when you use most of your electricity. Only a few companies are offering these at the moment, but more are expected to do so as the number of customers with smart meters grows. Some 41% of people we asked said they would be interested in time-of-use tariffs. Those who have smart meters already are more likely to be interested. Before you sign up to a time-of-use tariff, check carefully whether you’ll be able to use most of your power at the times it is cheaper. 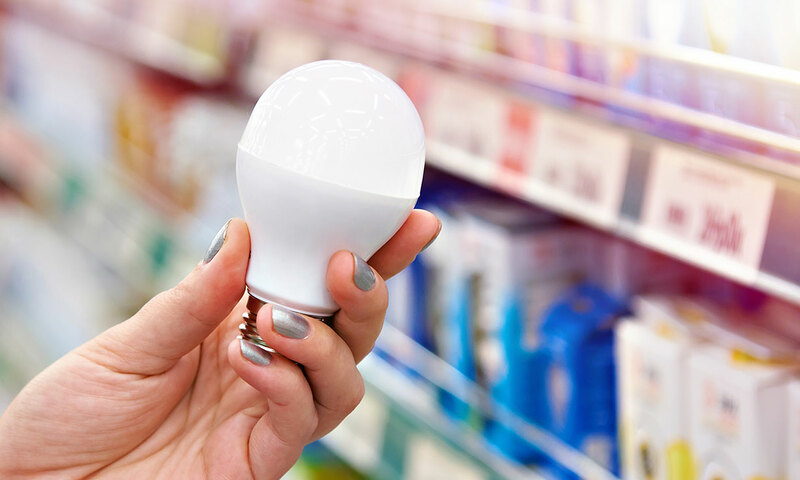 Moving your consumption to take advantage of cheaper prices could save you money, while using most of your power when it’s pricier is likely to add to your bill. Smart appliances were also of interest to 44% of smart meter owners and 37% of those who don’t have smart meters. 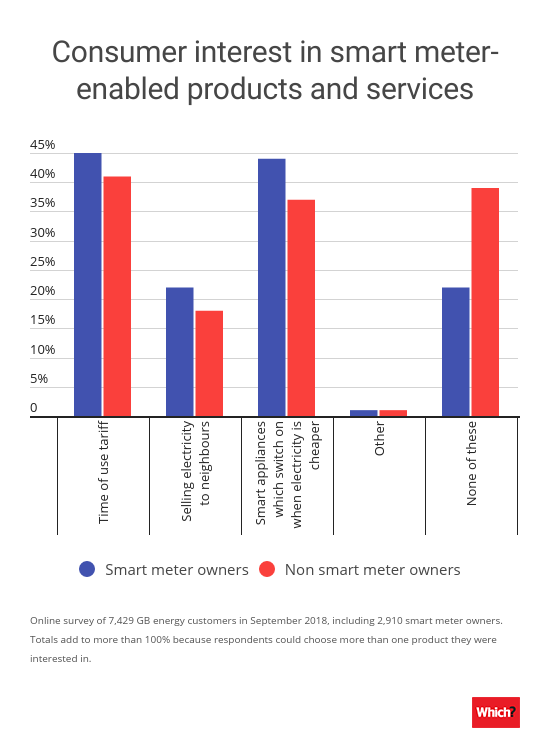 However more people without smart meters said they were not interested in either time-of-use tariffs, smart appliances or selling electricity to others.